Einstein on the Beach had been kind of a legend to me my whole post-adolescent life. I don’t know where I first stumbled on references to it, but it must have been in connection to the New York artists I was so taken with in my teens, people like David Byrne and Laurie Anderson, who either collaborated later with its principle creators or simply bore the marks of the downtown aesthetic of which it was, at least in scale, kind of an apotheosis when the opera premiered in 1976. At some point I got the boxed vinyl set of recordings – not sure if I owned it or if it came from the library and I taped it. But I spent a lot of time listening to a choir singing “1-2-3-4, 1-2-3-4, 1-2-3-4-5-6 …” and wondering what kind of stage production could be represented by the few photographs I’d seen, in which people stood in matrices of illuminated boxes doing cryptic actions, or seemed to be caught mid-way while falling in perfect unison out of chairs. It seemed, with all the kinds of abstract theatre and dance and music I embraced later, as if it was the influence on my tastes that I knew the least about. So it was self-consciously an Event when decades later, last weekend in fact, I finally had the chance to see a production of it in person, as part of Toronto’s Luminato festival. The production as a whole, all five hours of it, does turn out to defy speculation and certainly description. There’s something naive and hokey about it, on one level, with its Atom Bomb-panic themes, its Kafkaesque trial scenes, its Happening-style everyday-life importations, its use of big broad gestures and the Einstein iconography and even a little message about peace and love at the end, carefully framed with ironic distance just in case. There’s also an incredible discipline and rigour to it, whether in the performer-punishing repetition of the singing and movement or in the great tableaux and stage-paintings and feats of theatrical craft it builds out of what are, by 2012 standards, crude techniques. It’s the kind of theatre that seems in its spectacular visuality to be trying to compete with cinema until you recall that it’s actually happening in front of you, being carried out by bodies and voices and objects in motion. You can’t think about it too much or it seems too exhausting, as if you are almost complicit in an abuse. The producers try to ease some of that tension, and the anxiety that afflicts people when they’re told they’re going to be confined to a tight dark space for five hours, by saying that spectators are free to come and go, whenever they please, to stretch or go to the can or get drinks or just get out for a while. And even though this does involve a lot of being climbed over by your seat neighbours or people standing up in front of you or wandering around lost in the aisles, the spirit of non-coercion does seem significant, a delineating line between this “new” High Art and the old (though of course if you go back far enough in official opera history to when it was itself a popular art, people were even more shockingly informal, eating and talking and shouting at the stage). But the most pleasurable thing about the option to leave was, to me, that it made staying, never rising from the seat or even taking my eyes off the stage for more than a couple of seconds, also seem like a very voluntary choice. Because staying, and watching, and listening, and watching, and listening, turns out to be the way this piece works. This meditation on time and transport and technology reveals itself, elegantly and lightly mysteriously, as its own technology of transport and time. By about halfway through, I no longer had any idea how long I had been in the auditorium or how much longer I would be, and I no longer cared. The production is so full of small things done very slowly and again and again, and like the machinery of the industrial-to-post-industrial age that is its subject to the degree that it has one, the effects of these small things repeated and repeated proves cumulatively to be kind of monumental. I am not a person who is very capable of just watching, not thinking, not distracting myself – few people are, perhaps fewer and fewer. But that was what watching Einstein finally found me liberated to do, by this sympathetic collaboration between it and me. Different viewers will have varying highlights. By far the most unforgettable scene to me was “Bed,” the halfway point in the final act. 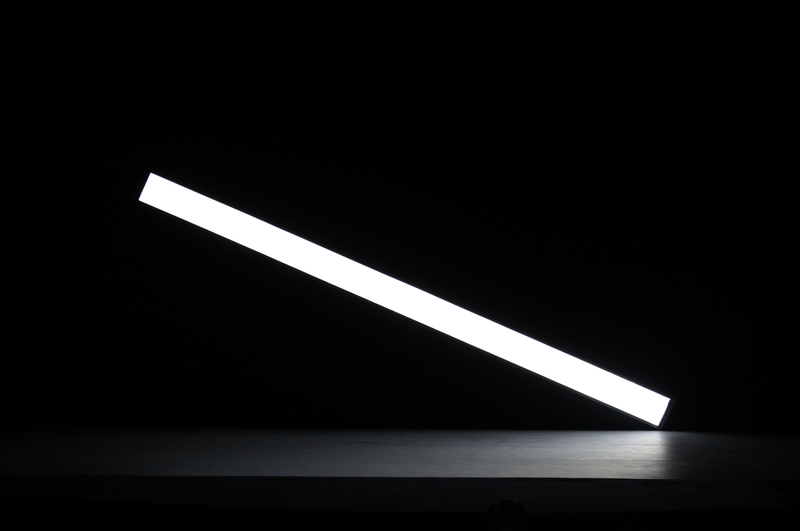 In it, what looks like a pillar of light but is actually the illuminated side of a huge bed on a pitch-black stage rises by millimetres from a flat position until it is perpendicular, levering gradually gradually gradually upward. Then, when it is perpendicular it begins rising straight up until it disappears into the flies above. Meanwhile a soprano sings a wordless aria to the relentless trilling of an electric organ. That is all that happens for what the score tells me is about 12 minutes but easily seemed like an hour. I was transfixed the whole time. When it started going straight up I almost cheered, saying to myself, “Thank god! I was hoping it would do that!” And when the last few inches of light vanished above the proscenium I came very close to bursting into tears. So on some level this show had rendered me kind of crazy, like someone who believes he’s having a love affair with an inanimate object, or at least infantile, like a child upset at the disappearance of the object (the phallus? the excrescence?) in a game of peekaboo. But what I was really having was just a very heightened experience of the passage of time and the arrangement of space. The kind certain hallucinogenic drugs produce. The kind that we have evolved pointedly not to have because it is a completely impractical relationship to have with the physical world. But the kind where everything feels lit up (this show is completely okay with being very literal). Six! Six! Six! Six! Let’s sing a song about six! How many is six? Yes, and how sol-fa is a soprano? How tall is light? How few is a monolith? How bright is darkness? How long is five hours? How far is a century? And what needs to happen in the relationship between the observed and the observer to let us sound out those questions without asking the story to at least lie up an answer? Relatively little, relatively everything.